FT Island’s Jong-hoon recently launched a small exhibition showcasing several pieces of his artwork as part of the FNC Entertainment family concert in Tokyo. The guitarist of the group displayed five paintings created around the concert’s “Starlight” theme, titled Deep Dream, Rock my story, 2009 So long, Au Revoir, 2008 Live Hour Tour and Over There. 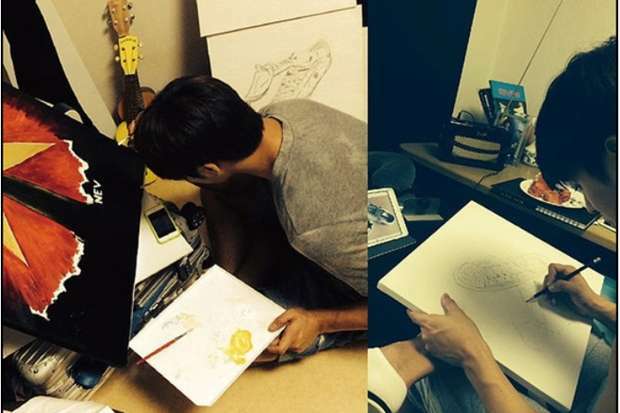 This, however, is not Jong-hoon’s first foray into the arts, having also designed the FT Island tour “The Passion” t-shirts as well as the jacket of their Japanese album So long, Au Revoir. 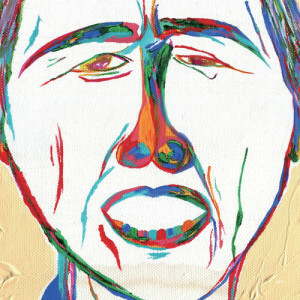 Nor is Jong-hoon the first to showcase his creativity in an area outside performance art. For idols with the inclination, fine arts has become a viable medium for them to take greater creative control of work, often translating into an increased intellectual ownership within their actual occupation as singers, dancers, rappers, and recording artists. Idol art galleries are not an uncommon sight – G-Dragon made headlines for launching his own this year held at the Cais Gallery in Seoul. Entitled “Space 8”, the exhibition served as a promotional event for the release of his second solo album, Coup d’Etat. The gallery featured GD’s lucky number eight as the theme, opening eight days after the album drop and showcasing exactly 88 objects picked by GD. These items included previously unpublished photographs, tour costumes, and concert props relating to his solo career as a musician, as well as themes found in Coup d’Etat. Shinee’s Key held his own exhibition in 2011. 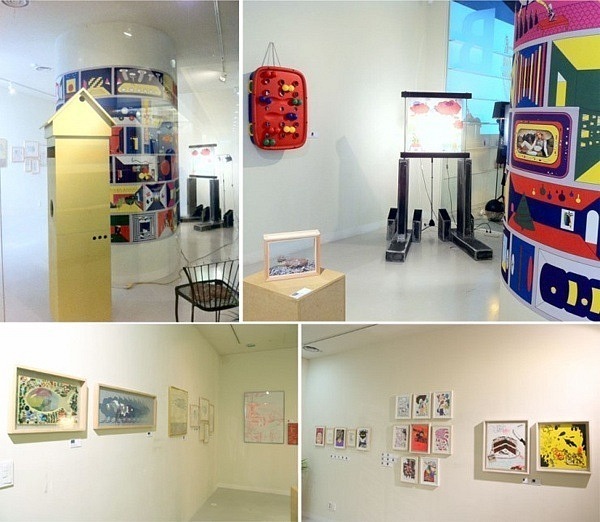 Located within Monaco Art Gallery in Seoul, the exhibition was entitled “Boogie-Woogie Planetary Exploration” and served as a collaboration between Key and his uncle, architect and designer Kim Dong-hee. Key displayed 16 original pieces of art within the gallery, clarifying that his intention of participating in the art show was due to a personal interest in the arts rather than a professional duty. However, Key’s artwork did later surface within Shinee as cover art for the group’s Misconceptions of Us album, and also appeared alongside the other members’ artwork in the album booklet. How many times in life will I be able to open my heart that has been closed tightly and meet “myself” with “memories and longing” tightly in my fist…in a world where I am not the controller, but a slave to time? As a celebrity, I had a wish that I wanted to communicate with the world as a “normal guy in his 20’s, sharing his day-to-day, immature life”… Not as Infinite’s “L”. L’s Bravo Viewtiful was ranked first in bookstore preorders in Korea, selling out immediately upon release and eventually breaking into the national bestsellers list at #13. The commercial success of the first book spurned a sequel, L’s Bravo Viewtiful Part 2 of the idol’s photographic works. In a more unique take on published art, Hongki of FT Island partnered with nail artist Kim Soo-jung to release Lee Hong-ki’s Nail Book. 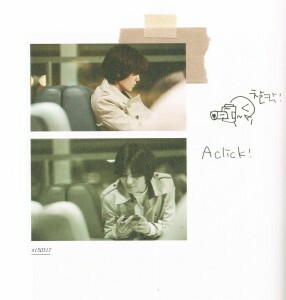 Originally a reluctant wearer of nail polish as an idol, Hongki eventually warmed up to the accessory and drew much attention for his elaborate designs. Lee Hong-ki’s Nail Book was marketed with a focus on mens’ nail art, and featured personal stories and nail designs by Hongki himself. Photobooks are, in practice, not an uncommon published product from entertainment companies who hope to capitalize upon an idol group’s popularity. Art or concept exhibitions have also been held by agencies in the name of fanservice, including the JYJ Exhibition and S.M. Art Exhibition Show, both in 2012. These expos featured galleries of photographs and physical artifacts from the idols involved, as well as highly interactive exhibits engaging fans and technology. Although my abilities are still lacking, my works will be displayed in Japan. I’m in the process of finding my own picture by painting different pictures. I ask for your interest. In the case of K-pop, here’s to hoping for a greater outpouring of artistry from those involved in the industry, regardless of medium. Be it fine arts, fashion, writing, or music, creative ventures in any field are essential to creating artists from idols in every sense of the word. Know any idols who art, readers? Are there any specific projects you’d like to see in the future?